Bring your die cutting in-line with a CMI Add-On Rotary Die Cutter. 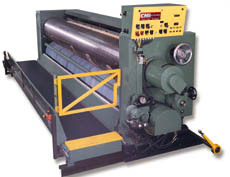 When you do your die cutting in-line you decrease the expense of materials handling and the need for extra personnel. It gives printer-slotters more versatility, allowing greater production capacity and the ability to run larger boards which turns into greater profits. All CMI Die Cutters include incrementally adjustable, digitally controlled 360 degree Running Registers. Along with an oscillating anvil cylinder, replaceable inserts and positive frame locks, this heavy duty machine comes completely pre-wired with easy to use operator controls and easy to read dials. If you're ready to get "in-line" with your die cutting, then it's time to give CMI a call. Die cut roll is drilled and tapped so that curved plywood steel rule dies can be mounted. Die cut roll has replaceable threaded inserts. Replaceable sectional polyurethane anvil roll covers. Hydraulic system with power pack to oscillate anvil roll laterally for extended life. Hunting tooth design for greater anvil and die life. Digitally controlled 360° running register.